Hello! Long time, no see! Or, no write. Since my last post, I’ve been hit with a small touch of writer’s block. Not that I didn’t have a queue of drafted posts waiting to be written, but I completely lacked the motivation to sit down and write them. And just when I thought I was ready to get back to it, I got hit with a head cold. It’s been brutal, but I’m refusing to let it keep me couch-ridden, so I’m back with a list of my current favorite beauty products. For me, Winter is a season that starts the day after Halloween. In reality, it starts a few days before Christmas, and I’ve always found this to be off-putting (that might have something to do with the lack of true seasons in California, It kind of messes with us). I’ve been patiently waiting to post my Winter beauty essentials until we got a bit further into the cold-weather season, and now that we’re making our way through January—and our first storm of the new year—this seems like the perfect time to tell you about my latest obsessions. Biosilk Silk Therapy Original – with the colder months comes lots of static. And I mean lots. Plus, I find myself styling my hair more often, now that it’s cool enough to wear it down instead of in a bun 24/7. This products does wonders for my hair, from taming flyaway strands to keeping it looking shiny all day, instead of dry. My advice? Use only a small, pinky-sized amount. This products goes a long way, and too much will cause your hair to look greasy and unwashed. Vaseline Lip Therapy in Creme Brulee – you guys. This is my holy grail lip balm. Holy. Grail. I bought it after my cold sore outbreak went away, and I haven’t experienced chapped lips since! I’m now fully addicted to Vaseline and I can’t see myself needing to use any other brand. Plus, the scent smells so good. It’s a win win. Too Faced Christmas in New York Merry Macarons palette – unfortunately, this was a special edition palette that is no longer available 😦 This was a Christmas gift from my mother and I’ve been using it religiously since I added it to my daily makeup routine. Since I have green eyes, I tend to gravitate towards bronze and purple hues to enhance the green and these shades do the trick. What I like most are the shimmery shades, as I think they add a little something extra during this festive season. Too Faced Peanut Butter and Jelly palette – another palette with lots of brown and purple toned shadows, and this one is sadly not in stock either 😦 I fell in love with it during the Spring of last year and it sold out fast (and still is) before I could get it. Then a month ago, I saw that Too Faced had restocked this palette, so I immediately ordered it. The colors are vibrant and last all day, and I love that it smells, too. If you need it in your life like I did, you can have Too Faced email you when it comes back in stock—which I recommend doing, because it doesn’t stick around for very long. I prefer this palette over the much-talked about, over-rated Sweet Peach palette (even if it’s a quarter of the size). Earth Therapeutics Triple Butter Intensive Foot Balm – let’s be real for a second. We all get dry skin during Winter. It’s inevitable and unavoidable, especially when it comes to our hands and feet. But very few people want to talk about feet (ew, gross), so we mostly focus on keeping our hands moisturized and crack-free. I’m here to tell you that your feet need love too. And this foot balm is amazing. I use it every night after I shower, and it keeps my feet feeling soft and looking like I just came out of a pedi from the nail salon—but much cheaper and more hygienic. It smells like peppermint and has a lot of beneficial ingredients. So stop neglecting your feet, and invest in a good moisturizing lotion to keep them in good shape, before flip flop season arrives. Becca Ultimate Coverage Complexion Creme – I think I’ve gone through seven different foundations in the last five years. I’m not kidding, if I don’t love it by the time I’ve run out of it, then I purchase something new when I need more foundation. But I think I’ve finally found my favorite (though, I’m still debating on giving Estee Lauder double-wear a go before I thrown in the towel). The coverage offered by this foundation does exactly what it says: it provides full coverage that lasts all day. I rarely get blemishes, but when they do occur this foundation covers them up without a trace. You’d never know what is hiding underneath! And despite it being a full coverage, liquid foundation, it still looks natural on my face. And that alone is worth shelling out money for. Kate Spade Live Colorfully Eau de Parfum Spray – this was another Christmas gift from my mother and I’ve been wearing it almost every day since the holidays. It has a very floral scent, which I used to shy away from but now embrace. It lasts for hours, especially when I spray it in my hair. I get a lot of compliments when I wear this perfume, so I think it’s going to be a staple in my collection. e.l.f. Liquid Eyeliner in Coffee – this was a free-item-with-purchase I received a month ago, and I’m really digging it so far. Despite being a very affordable drugstore product, it lasts just as long as the expensive eyeliners I’ve purchased from Sephora. I’ve always preferred brown eyeliner to black, as black looks a bit blue on my skin. This brush makes it super quick and easy to apply a straight line, something I need because my shaky hands make applying a liquid line rough. I think I’ll be sticking to this brand of eyeliner for a while. Becca Shimmering Skin Perfector Pressed Highlighter in Champagne Pop – my go-to, every day highlighter. I adore this color, as does, I’m sure, most of the makeup buying people across the globe. While I’ve never been a fan of watching videos on YouTube (I don’t have that kind of attention span, sorry), I really do love the products that beauty-guru Jaclyn Hill has put out with Becca. The quality of this highlighter is wonderful, as it has withstood me dropping it, cracking it, using rubbing alcohol to smooth it back out, and continuing using it every day after. Whew. I’d recommend this product to anyone adding highlighters to their routine for the first time, and you can’t go wrong with any of the other colors as they are all gorgeous and have a great pay-off. e.l.f. Highlighter Brush – of course, you need a highlighter brush to apply your shiny, new product and with this brush, you don’t need to break the bank to achieve the look you’re going for. While some of the brushes I’ve purchased through e.l.f. aren’t so great for applying liquid products, I’ve never had an issue with any of their brushes designed for powdered products. This is a great purchase for both your wallet and your face. Bath & Body Works Ultra Shea Body Cream in Vanilla Bean Noel – this limited edition, holiday scent has been my favorite since I was in high school. While I doubt this will ever be discontinued, I like to load up on extra tubes of lotion just in case—as well as to keep my skin smelling like cookies all year long. 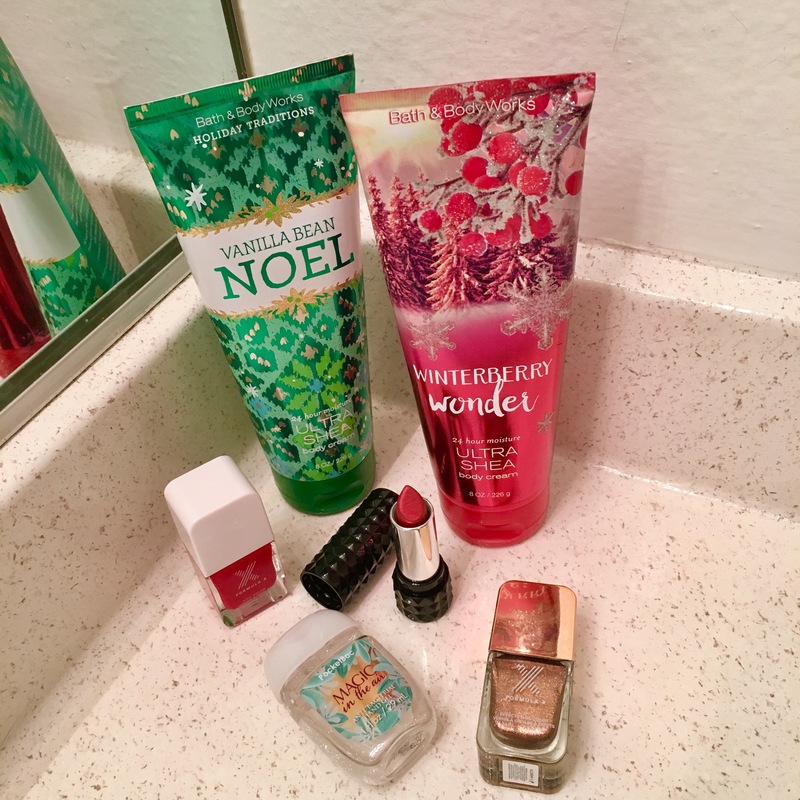 Bath & Body Works Ultra Shea Cream in Winterberry Wonder – another limited edition, holiday scent. Last year I was introduced to this scent and it didn’t take long for me to fall in love. I adore it in both lotion and body wash form, and if B&BW ever decided to turn Winterberry Wonder into a candle, my life would be complete. My wallet, though, would be empty. Formula X Nail Polish in Alchemy II– okay, I had a mini panic-attack when I couldn’t find any Formula X nail polishes on the Sephora website. Since I haven’t visited the store in a while, I’m hoping they still carry the brand. Because I adore this rose gold color. It’s perfect for New Year’s Eve, a party, or when you just want to feel a little extra glam. Kat Von D Studded Kiss Lipstick in Adora – this is my holy grail red lip. I’ve lost count of how many times I’ve been told by family, friends, and complete strangers that this is my color. And this is the first lipstick I’ve ever purchased that I finished to the end and had to repurchase. It’s safe to say that I found the right shade for my wedding day. Bath & Body Works PocketBac Anti-Bacterial Hand Gel in Magic in the Air – this product doesn’t come up online, but I’m willing to bet it’s still being carried in store. I constantly keep hand sanitizer with me when I’m on the go, and this particular scent was a gift from a friend. I love the fragrance and I get a lot of compliments on this, as well. Formula X Nail Polish in X ❤ Rouge – my favorite red polish. Since I’ve had it in my clutches, I haven’t felt the need to switch to any other brand or shade of red. The only annoying bit is that this is a polish that gets everywhere when you remove it with acetone (you know what I’m talking about). But I endure it every time, because the color is so vibrant and long-lasting.